Mike began his coaching career at Martinez Community Swim Team, where he was an assistant coach for twelve seasons. He became Head Coach of the Alhambra High School Boys’ Water Polo Team in 1997. Seeing the need for age-group and high school level club water polo in the Martinez/Pleasant Hill area, Mike helped form the Aqua Pigeons Water Polo Club in 2007. With Mike as the coach of Alhambra, the program became consistently a Top 10 NCS program. He helped Alhambra make four straight NCS Division II Championship game appearances. In 2013, Alhambra High School won its first NCS title with a 9-6 win over Redwood HS. Mike stopped coaching Alhambra Water Polo after the 2013 season to focus on the 680 12u Boys program. 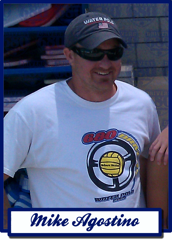 In 2010, Mike started coaching with 680 WPA as high school age-group coach. After a season with our high school program, Mike took over as our 12 & Under Boys Head Coach. Mike’s ability to build a program through coaching fundamentals is a perfect fit for our 12 & Under program. Mike was honored with USA Water Polo's 2018 Ted Newland Distinguished Men’s Coaching Award (Developmental).